A stray dog who kept chasing after a bus won herself happy ending after the bus driver ended up stopping and adopted the determined dog. 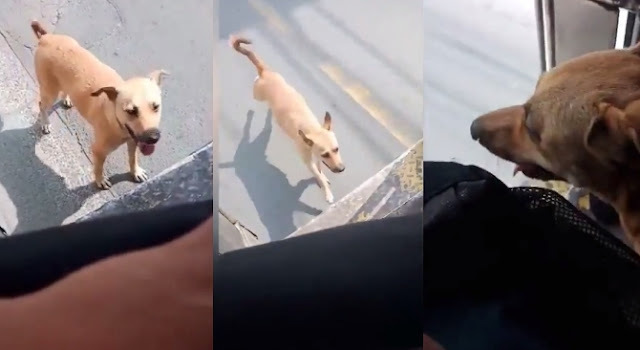 According to passengers riding the jeepney in Quezon City, Philippines, the young Aspin breed of dog took an interest in the bus and started following the vehicle. When the bus pulled away, the dog kept up with it – attempting to leap aboard. At one point the female dog had her paws on the steps and tried to leap in but fell back onto the road. The bus driver was reluctant because he was afraid the dog might bite a passenger. Many stray dogs in the Philippines are feral and numerous street dogs carry rabies. But eventually the driver pulled over and scooped up the stray, after realizing the dog was very friendly. So friendly, that passengers say the driver has adopted the dog. Here’s a clip of the dog chasing after the bus. Keep an eye out for the last shot, which shows the dog was successful on her mission! Responses to "Stray Dog Chases After Bus Until Driver Adopts Her"